Even if I do the ice challenge, no one can see it because my phone doesn’t have the camera… unless I can hook my camcorder up to the internet. How do I make the internet read video tapes? I hope he donated before freezing his head. Welcome back, Biff! This one’s a winner! OH MY GOD IT’S BACK, HURRAY! THANK YOU!!!!! Welcome back, Biff! We’ve missed you! 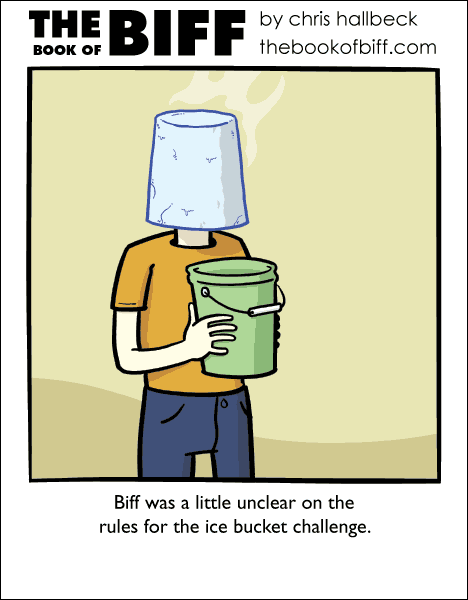 Good to see you again Biff… even if through a block of ice. Hurray! Biff is back! I love Biff! Glad to see you back. I hope it stays. wo0o0o0 I clicked back to here on accident and said “whaaaaaaa that’s no pancake with bacon thread” glad to see a new one up! Yay. Biff is back. I’ve missed this comic so much. Thanks Chris. Welcome back Biff! Made my week! Wooh! Great job, Chris! I’ll always be glad to see Biff, no matter how long it’s been. I failed a Lice Bucket Challenge. Half my paycheck is going towards flea collars now.